Have you made Chess Pie -- Mrs Huston? 1. 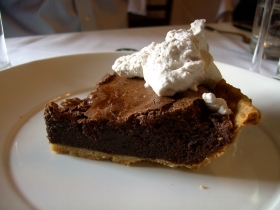 A chess pie is a custard pie, with or without the addition of fruit. 2. This is a tropical recipe for this Southern favorite, though the most traditional versions usually use buttermilk. 3. 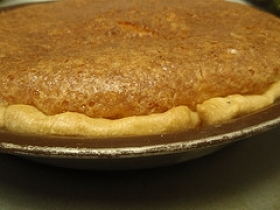 Chess pies often are baked in small pastries for individual servings and sometimes are topped with whipped cream or preserves at serving time. 4. Cream the butter, adding the sugar gradually. 5. When blended, add the raisins and beaten eggs. 6. Bake the crust on an inverted muffin tin. Fill the shell 3/4 full, and cover with meringue. 7. Cook in a moderate oven, and, when the meringue has browned slightly, stir the meringue briefly into the mixture with a fork.